Anne Simons started her studies on the violin at the age of ten with Thomas Williams. She graduated from McGill University with a Bachelor of Music and then received her Masters of Music from the University of British Columbia under the guidance of Andrew Dawes. 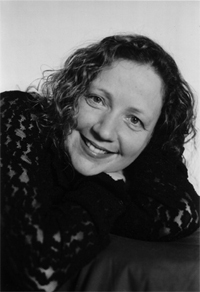 Since 1990 Anne has taught, performed chamber music and acted as co-director at CAMMAC Music centre in Quebec; taught at the University of New Brunswick Music Camp and has spent many summers playing in the pit orchestra for “Anne of Green Gables” as a member of the Charlottetown Festival. Anne is a founding member, Co-Artistic Director and the second violinist of the Blue Engine String Quartet. The Quartet has a busy concert season in and around the Maritimes and is heard frequently on CBC Radio. Anne has been on the Faculty of Acadia University, the Maritime Conservatory of Performing Arts, and has a private teaching studio. Since 1996 she’s been a member of Symphony Nova Scotia, and lives in Halifax with her partner Rod and their two children.